from Pegeen Ryan's portfolio development course. Create an app or service that solves a problem. After brainstorming various concepts, my partner Danny Robinson (copywriter) and I settled on an app that makes lunch an efficient adventure by minimizing wait times at popular chain restaurants. Since most users would come into the app looking for restaurant information, the first screen would be the list. 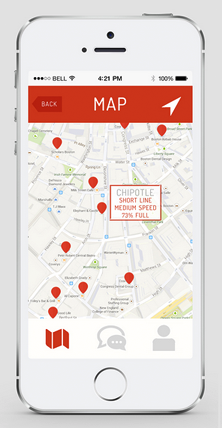 Initially it was envisioned as a map with geopins until feedback convinced me a Yelp-like list would be more efficient. The default filter would be distance, with options to sort by line length, speed of service & restaurant capacity (%full) if the user wanted to sit and eat. All this data about the restaurants had to be crowdsourced, which leads to the second screen (indicated by the "comment" icon). The form was purposefully designed to require minimal typing, hence the use of sliders and a dropdown menu. Comments were optional. Once the form was filled out, the user would be thanked with a reward (out of 4 options) to the restaurant they had just reviewed. If they chose not to use the reward right away, rewards would be saved in their profile (final screen). Peer feedback presented a valid issue: what benefits would restaurants receive from the partnership? The answer: vendors could send push notifications to users during slow business, encouraging further traffic. To launch the app, participating restaurants would have a limited time food truck event with 50% off menus, promoted by social influencers & websites. The inevitable long line would create an ideal environment and example for the use of Lunch Rush, incentivizing users to download and test the app. Partner restaurants would affix Lunch Rush stickers to their to-go bags and boxes for further outreach.